The storyline to this game is pretty simple. You are a Merc, a professional mercenary, and you have to rescue the former U.S. president from the hands of terrorists. You have to make your way through the lands of Zutula (I believe) fighting against the rebels. This game is a port from the original coin-op version. The most noticeable difference from the arcade version is that this game is only one player. Bit of shame, since this could have been even more fun with 2 players. Nevertheless, the gameplay is pretty good. 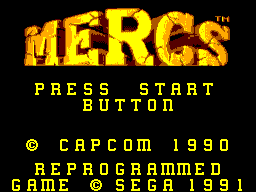 You control a merc and your objective is to make your way through the levels destroying enemy soldiers, buildings, tanks and the like and fight the boss at the end of each level. 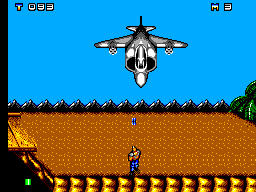 You view the game from a bird-eye view perspective and you character is free to roam about in all directions (similar to Secret Command & Time Soldiers but better). Scattered throughout the levels are crates you can shoot open which contain power-ups that include; different type of gun, a power increase for the gun, a mega-bomb, health and a medal (points I assume). A great feature is the ability to drive a truck and a dinghy at times. I think the graphics are amazing. 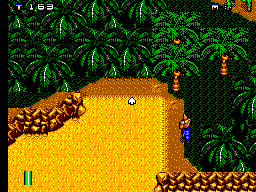 The levels are big and ranging from the jungle-land to city buildings and graphics portray these excellently. The sprites for the enemies and tanks and things like huts are great. The graphics go for a more realistic look and they really give the feeling of a war zone. The big boss' are also great to look at. Seeing your enemies being turned to a black fiery corpse after taking a flame-thrower to them is also quite satisfying. You won't find much better graphics than these for the SMS. There isn't much of way in the music for this game. There are small tunes played during the intro, end-of-level point’s screen and the ending which are ok. There is a nice touch where a tune starts playing just as you reach the boss which lets you know to prepare for battle. Gunshot, explosion and grenade throwing sound effects are all included but they don't sound very good. This is probably the games biggest let down. The controls are very simple and you can't go wrong. You character can move in 8 directions at a good speed. One button is for your normal gun shot and the other button is for a mega-bomb. The controls are very responsive and make the game a joy to play. This game is known to be pretty easy to beat. You won't beat it first time but after a few tries you can. The hardest part is the fact you have a time limit to complete the level which counts down pretty fast. Strangely there are no lives, so once you die that's it, you have to start again but that's not too much bother since the game is fun to keep going through. It's pretty short (I'm sure the first level is over in under a minute) but it's such a fun game to play you'll keep coming back to it. An excellent game and one any SMS owner should have. There isn't really anything too much wrong with it and anyone should be able to pick up and play it. It's pretty enjoyable and I find myself having a quick go at it every so often. After a few goes at it you'll find it fairly easy but it's still a great game which often goes overlooked. In my opinion it's one of the better SMS games around and if you don't own it you should have a look for it on eBay or whatever now.